At the UK AD & Biogas and World Biogas Expo 2017 in Birmingham on 5th July 2017, WELTEC BIOPOWER received the renowned AD & Biogas Industry Award in two categories from the British anaerobic digestion association ADBA. An independent expert jury nominated the German biogas plant manufacturer in the category 'Best international agricultural project' in recognition of its 800kW plant in Colombia. The 'Best international commercial plant' award was given to WELTEC BIOPOWER for its 1MW plant in Melbourne, Australia. The Anaerobic Digestion & Bioresources Association (ADBA) also organised the gala night at which the winners of the various categories were announced and received their awards. This was already the sixth time that the renowned industry award for outstanding projects, products and services from the biogas industry was conferred. WELTEC BIOPOWER was honoured and pleased to receive two of the ADBA Industry Awards. "Both projects had their own special challenges and were already very demanding in planning. Therefore, we are delighted that both plants not only work successfully, but have now also been awarded with these prestigious awards. The awards encourage our entire team to continue to develop smart and !exible solutions for our customers," said Kevin Monson (pictured fourth from left), Sales Manager. The construction of the AD plant for Colombia‘s largest egg producer took place under consideration of the high quality and hygiene requirements of the South American agricultural industry. This was one of the main reasons why investor Juan Felipe Montoya Muñoz had opted for stainless steel tanks from WELTEC BIOPOWER. Montoya Muñoz owns several poultry farms in Colombia, at which about 3.5 million eggs are produced every day. As the process yields large amounts of dry chicken manure and process water, the 800kW biogas plant can be operated without using any other substrates. Right from the planning phase, WELTEC BIOPOWER took the investor‘s expansion goals into account and planned and built this agricultural energy plant according to industrial standards. The experience gained with industrial standards is also useful in other projects. WELTEC won the award with a 1MW biogas plant in Melbourne, Australia. The basis for energy generation is 100 tons of organic waste a day. More than half of this amount will come from cafeterias and restaurants. The rest will comprise fats and oils, brewery and dairy leftovers, fruit and vegetable waste and sludge that will be pumped from the adjacent wastewater treatment plant. The operator Yarra Valley Water is one of Australia‘s largest water supply and wastewater disposal enterprises and is now able to satisfy its energy needs at the Aurora site from biogas. Besides Yarra Valley Water can fed surplus electricity into the public grid. The objective of the ADBA contest is to draw attention to such intelligent plant concepts. 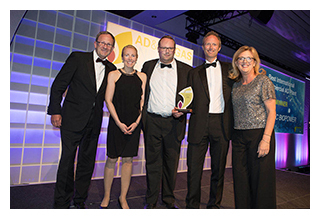 "Their dedication to enhancing our industry‘s reputation and performance is testament to the innovative and entrepreneurial spirit that has built the AD industry," said Charlotte Morton, Chief Executive of ADBA. In the opinion of David Newman, the award winners and the companies that have been shortlisted "serve as a shining example of how biogas can help to meet the UN Sustainable Development Goals."